JUNK RIVER’S SECOND ALBUM SOON AVAILABLE! 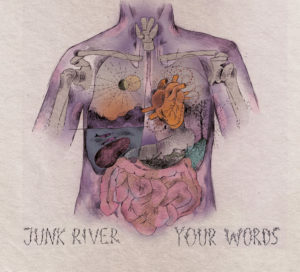 In just about a month we will release Junk River’s second album ’Your Words’. They will host a release party at Plan B in Malmö on April 21st. Junk River, based in Malmö tell tender stories embedded in enthralling and vivid folk. With their first self-titled album they have toured and spellbound audiences from Luleå in the north to Frankfurt in the south, and now we’re releasing their second album. The honest and beautiful lyrics are about surviving depressions and about sitting in the waiting room at the gender identity clinic. The music consists of curious guitar picking and accordion melodies intertwined with wandering bass themes and charismatic drums. It’s hard to not feel moved.